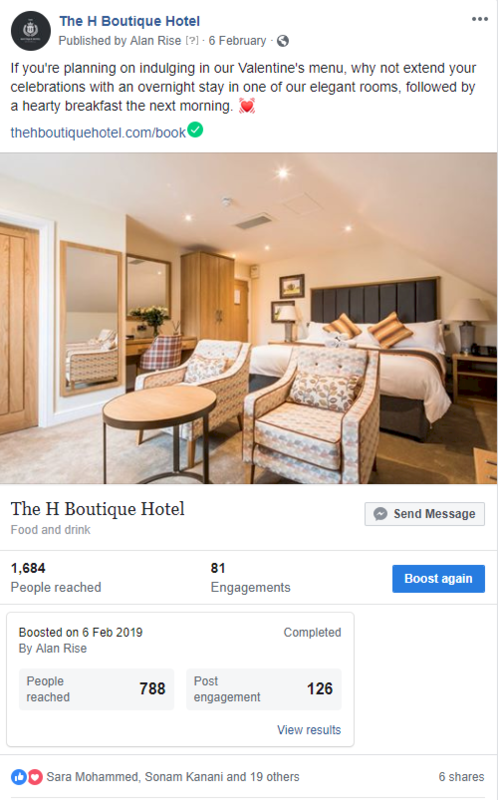 As a brand new boutique hotel based in the heart of Bakewell, The H Boutique Hotel required the creation of a long term marketing strategy to help shape their online presence, build their following, and encourage more online conversions. We were approached by the general manager who believed the social channels weren’t depicting an accurate representation of the hotel, and wanted a thoroughly planned strategy to turn this around, with the long term aim of reaching online users that had a higher potential of becoming conversions. The first action required from us, as laid out in the strategy, was to work towards creating a tone and image fully reflective of The H Boutique Hotel. This was achieved through attending meetings at the hotel on various occasions to get a feel for the character of the establishment and establishing who the target customers are through discussions with staff members, competitor research, and our inside knowledge gained from working with other brands and businesses in the hospitality industry. We began creating and scheduling posts that put high quality, elegant imagery showcasing the various USP’s of The H Boutique Hotel at the forefront of the content. 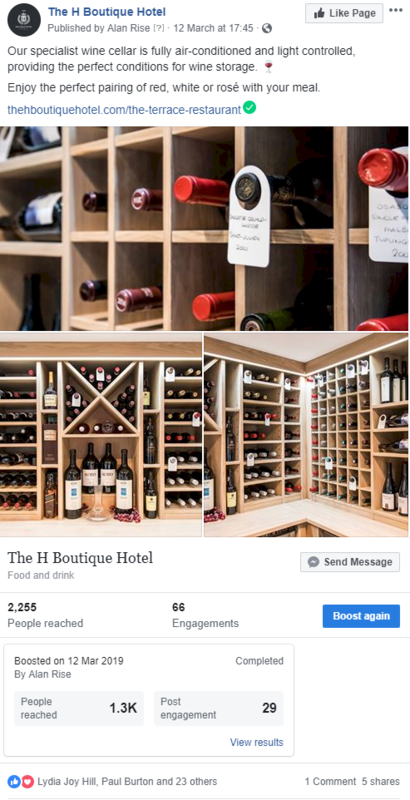 We ensure this strikes the right balance between showcasing the food, hotel interiors, room interiors, and upcoming events and offers, to give potential customers a good idea of the entire package The H Boutique Hotel has to offer. Every post is drafted with the target audience and overall strategy in mind, to ensure the wording and the imagery used is consistent and relevant. 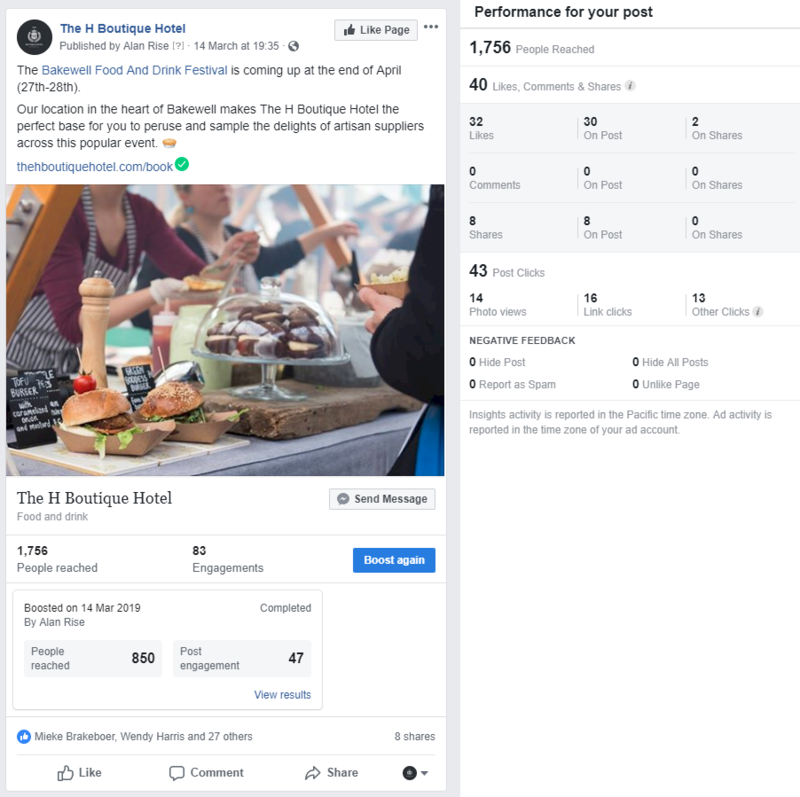 Now an accurate image has been depicted of the hotel on social media, the focus has turned to growing the following and engagement rates through paid Facebook advertising campaigns. We’re now at a stage where we have a refined audience that are likely to engage with the content and build a relationship with the page, increasing the chances that they will go on to become customers. At present, we’ve achieved the following from the strategy we’ve been implementing for The H Boutique Hotel.